A 2-year-old dog is doing double mothering duty, as the dog is not only caring for her newborn pups, but a litter of kittens, too. 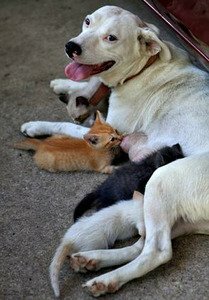 Molly, a dog, has been mothering six kittens since their mother was killed. Elbert Bristow, 84 of Columbia, Ala., accidentally ran over the mother cat, named Kitty Kitty, shortly after she had given birth to six kittens. Coincidentally, his dog, Molly, had given birth to three puppies the day before the kittens entered the world. With no mama cat to supply milk for her kittens, Molly stepped up, and, with her three puppies kept in a separate location, feeds the tiny felines on a regular basis. When the kittens aren’t feeding off the dog, they follow her around. Bristow plans to give all but one kitten and one puppy away.